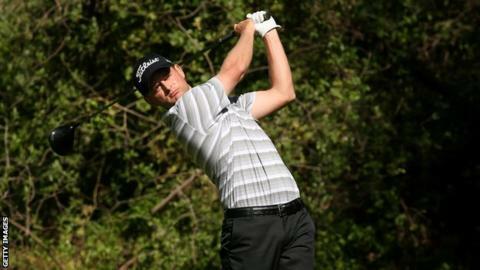 John Merrick beat Charlie Beljan in a play-off at the Northern Trust Open to win his first US PGA Tour title. Defending champion Bill Haas was the overnight leader but five bogeys in seven holes around the turn ended his title bid as he finished with a 73. American Merrick who shot a two-under 69 to join Beljan (67), took the title with a par at the second extra hole. Charl Schwartzel (70) and Fredrick Jacobson (69) missed putts to get in the play-off to join Hass on 10 under. Luke Donald, who started the day in joint fifth place, fell away with a triple bogey at the 12th as he carded a four-over 75 while fellow Englishman Lee Westwood, who was level for his final round, ended a shot further back on three under. "Growing up in LA, I just wanted to come to this tournament," said Merrick, who was brought up in nearby Long Beach. "To win it is a dream come true." Merrick was one of three players who started the day three shots off the lead and he had four birdies and two bogeys as he closed on 11 under. Beljan drained an 18-foot birdie putt at the 72nd hole to seize his place in the playoff - the American's four-under par 67 matched the best score of the day. After both players parred the opening play-off hole they returned to Riviera Country Club's par-four 10th. Merrick reached the green in two, while Beljan drove into the rough and hit his approach to the fringe 71 feet from the pin. Merrick's missed his birdie attempt but tapped in for par. Beljan, who had putted up to five feet, then saw his par attempt slip past the cup.